Holi, apart from being the festival of color and joy, it binds everyone together. It is one of the ancient festivals celebrated and therefore, has many rituals linked with it. As a part of these rituals, gifts are exchanged between people. This enhances the importance of gifts on Holi. The ritual of exchanging gifts plays an important role in building and maintaining cordial relations with your near and dear ones. 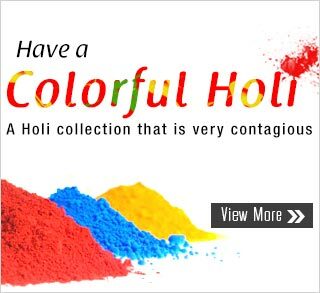 Holi is enjoyed and played by everyone in the family and thus, there is a gift for every member. The perfect gifts have also made an appearance this season, we have our exclusive Holi collection out now! From stylish white colored apparel to favourite cartoon character pichkaris for kids, we have a large variety of color and appetizing food and mithai holi special hampers to complete the occasion. You can also view our Holi special deals section and select the best one for your loved ones. Our Holi collection is bright and vibrant, it’s also sure to bring a smile to the faces of your loved ones and ensure that a grand celebration ensues. ← Fun Fun Fun with our new kids collection !